safety and ease of use. Please link back to me any images you have produced using this prop, thanks. bambooji (8 weeks ago) Inappropriate? Simidae (3 months ago) Inappropriate? I needed exactly this just now. Just one issue, the release latch dial is not doing anything. Teri Perkins (4 months ago) Inappropriate? Every house needs one of these. Thank you! greywall69 (4 years ago) Inappropriate? Love the work! Had difficulty downloading/unzipping. On a Mac, the download seems to hang. Had to stop the download, change the file extension from Mousetrap.zip.download to Mousetrap.zip, then open with stuffit expander. almostperfekt (5 years ago) Inappropriate? That looks completely real! Great job. Thank you. theDuckPond (5 years ago) Inappropriate? katanas (5 years ago) Inappropriate? Limnery (5 years ago) Inappropriate? Terrific model. Thank you for sharing it! 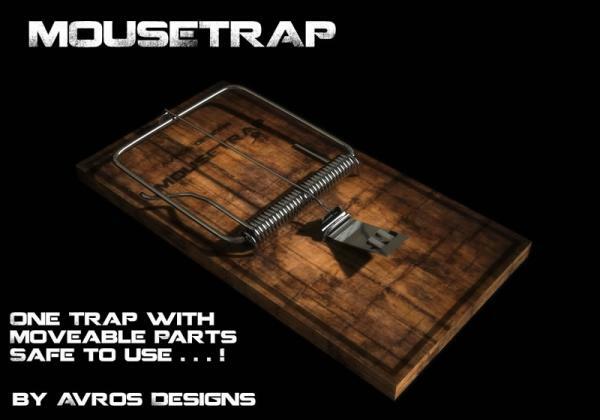 If I catch my finger in this trap I'll sue someone! Thank you. jammixx (5 years ago) Inappropriate? Paula Sanders (5 years ago) Inappropriate? Nice prop, very detailed. Thank you.